The carbonaceous π-conjugated/polymeric materials have been emerging as suitable materials to synthesize nanocomposites because of their attractive nanoporous structure, controllable surface chemistry, mechanical strength and favourable interactions with the semiconducting materials. The photocatalytic performances of the traditional polymeric materials are generally poor. Their performances can be greatly improved by coupling with a host semiconducting material. This is mainly due to their unique crystal structure, stability, high conductivities, nature of formation, efficient catalytic activity, promising electrochemical and optical properties. These polymeric nanocomposites act as photo sensitizers and good visible light absorbers due to π–π* electronic transitions. 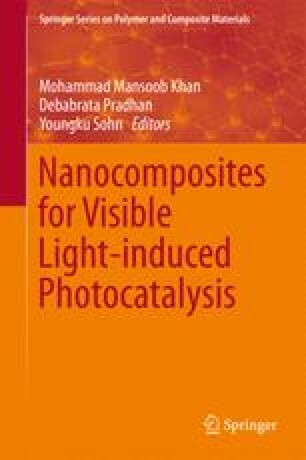 In this chapter the preparation methods, microstructure analysis and photocatalytic mechanism of graphitic carbon nitride (g-C3N4) and various carbonaceous π-conjugated/polymeric material composite catalysts are focused. In particular, modification of g-C3N4 by various carbonaceous π-conjugated/polymeric materials result in hybridization owing to strong π–π stacking interaction, which stabilizes the hybrid nanostructure and efficiently utilize the solar spectra by extending the photocatalytic applications in NO removal, CO2 reduction and oxygen reduction reactions, water splitting to liberate H2 fuel and degradation of pollutants. The challenges of various π-conjugated/polymeric material modified nanocomposites of g-C3N4 in the field of photocatalysis are also highlighted in this chapter to extend their applications in sustainable energy development.